Julia Florentia Mulock was born July 24th 1842 and died April 23rd 1910. I first came across her when I was writing about Afghanistan, a member of a military family which had some interesting connections to Bamiyan. Since then I’ve continued to stumble over information about her, and the more I’ve discovered, the more fascinated I’ve become with the peculiar lives led by the British officer class in nineteenth-century India, privileged, violent and above all precarious. 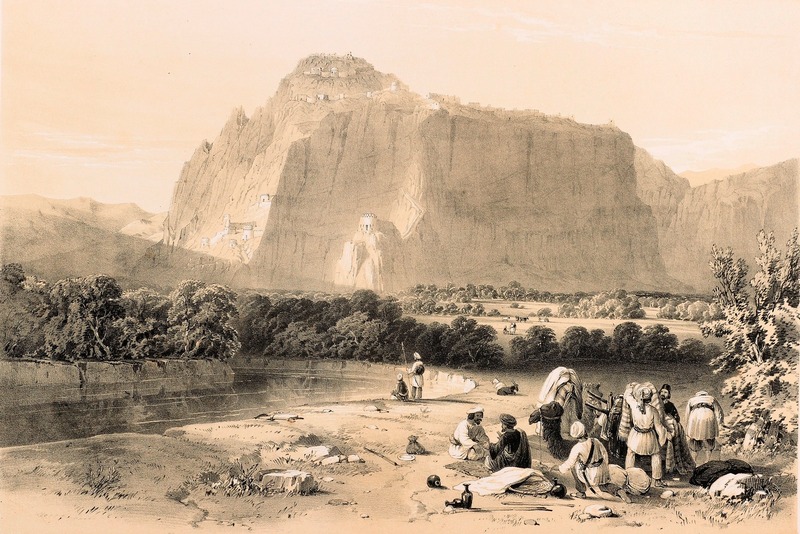 The image at the top of this post, a view of a castle at the eastern end of the Bamiyan valley, was sketched by Lt. John Sturt, Julia’s father, in August 1840. The British, who had invaded Afghanistan in the previous year, were securing their northern borders, and Sturt was reconnoitring the vitally strategic passes through the Hindu Kush. A year later Sturt married Julia’s mother Alexandrina (Dinah) Sale, the daughter of Lady Florentia Sale, in Kabul, and in its small way this illustrates the dangerous complacency of the British occupiers, settling into familiar rituals of camp life unmindful of the powder keg they were sitting on. Things unravelled very quickly. In January 1842 the British were forced to retreat in freezing conditions through the passes between Kabul and Jalalabad. The retreat turned into a massacre, and Sturt was one of thousands of fatalities as the column of British and Indian soldiers and civilians was annihilated by the Afghans. I became very intrigued by this baby girl who travelled to Bamiyan when a month old, and gave “Afghanistan” as her place of birth in a census thirty years later. 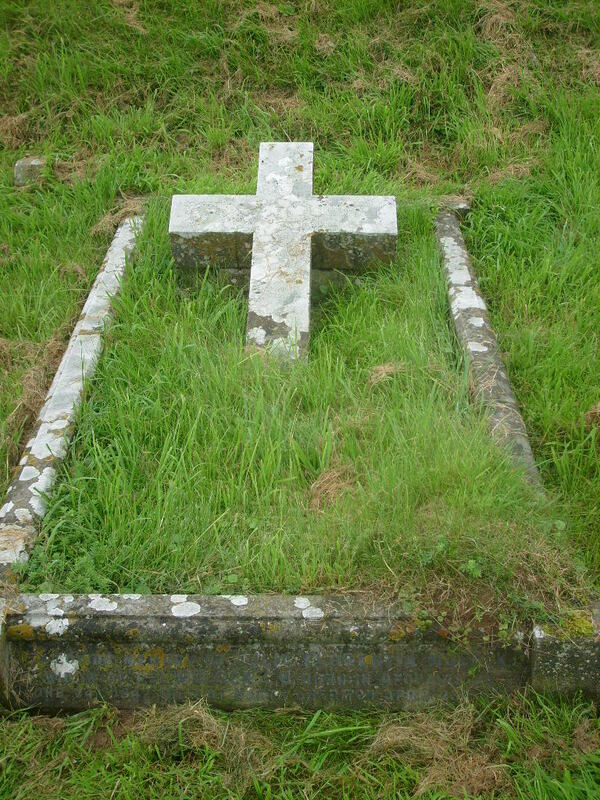 I even tracked down her grave in rural Somerset (she died in 1910), again with that wildly incongruous place of birth, and wrote about her, explaining amongst other things how as a two-year-old in 1844 she, her mother, grandmother and grandfather (Maj-Gen Sir Robert Henry Sale) were fêted across Britain, mobbed by crowds wherever they went and given an audience with the Queen: at the time Lady Sale was the most famous woman in the Empire, with the single exception of Victoria herself. I also described how the girl who lost her father before she was born lost her mother in equally violent circumstances fifteen years later, during the “Indian Mutiny”; and how after all of that Julia went on to lead the same strange life of an officer’s wife as her mother and grandmother had done. When I wrote about Julia back then there were still some niggling gaps in her story. What I most wanted to know was where Julia was on the eve of her fifteenth birthday in July 1857, when the second great trauma of her childhood occurred, the death at Segauli in Bihar of her mother and stepfather at the hands of her stepfather’s troops during the “Indian Mutiny”. I wasn’t certain that she hadn’t been living with her parents when they died, and initially I had assumed she had died at the same time. I now have clear evidence of Julia’s whereabouts, but I’ll come to it indirectly. Because I also found myself reading the will of Julia’s grandmother, Lady Sale, the heroine of the hour after the hostage crisis. After the death of her husband in 1845 Lady Sale was the recipient of a pension from the Queen which allowed her to retire in some comfort to an estate in Simla. She died in 1853. Two details of Lady Sale’s will interest me particularly. The first is a reference it makes to her granddaughter Julia, the only case where she bequeaths a specific item to a grandchild: “My Globes I give to Julia Florentia Sturt.” The gift of (presumably) a terrestrial and celestial globe suggests to me that Lady Sale and Julia had spent significant time in each other’s company. It was certainly an appropriate bequest from the well-travelled Lady Sale to her granddaughter, who was born in Kabul, died in North Cheriton, Somerset; and in the interim spent extended periods of her life in India and New Zealand. The other intriguing detail in Lady Sale’s will was a bequest to Julia’s stepfather (by this time Alexandrina had remarried): “I give my coins to my son-in-law James Garner Holmes, he being the only person in my family that has a taste for Numismatology.” Coin collecting was all the rage among the British and Europeans in N-W India at this period, mainly because coins offered the readiest access to something that greatly interested them, the period of Greek influence in the region dating to the last three centuries BC. I had no idea Lady Sale was another coin collector, but subsequently Dr Liz Errington at the British Museum pointed me to coins she donated to the Museum during her triumphant tour of Britain in 1844: for example this one, which she had picked up in Afghanistan. Major Holmes is a fearful story. He raised the 12th Irregulars (cavalry) & loved them as his children. They were doing zealous service, severely punishing offenders, and keeping a district quiet, till the moment they hacked him & his wife to pieces & burnt the doctor and his family, all but one child saved by an ayah. Mrs Holmes was the daughter of Lady Sale, widow of Lt. Sturt who was killed in the Cabul retreat. Her child born in that captivity, I am glad to hear, was safe in England. What strikes me about this is that in 1857 people’s impulse, on discovering how Alexandrina died, was immediately to wonder what had happened to her daughter Julia: in other words, the same reaction as mine, 150 years later. In this instance some quite important people were concerned about her, since the letter is from Lady Canning, wife of the Governor-General of India during the “Mutiny”, Lord Canning, to Queen Victoria. In 1861 Julia married an officer, Thomas Edmonds Mulock, and began her own life as a military wife. 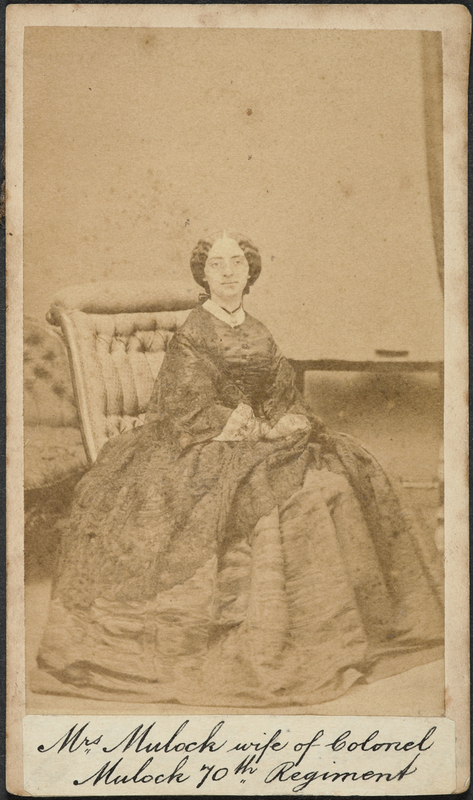 Here she is between 1863 and 1865, in her early twenties. Lt Col Mulock was in fact twenty-five years her senior. Julia was in New Zealand because her husband was involved in the wars between the British and Maoris: the little wars, which weren’t little if you were in them, were being fought pretty much continuously by the British in the nineteenth century, as Florentia, Alexandrina and Julia could testify. As for the photo, it does, I’ll be honest, mean a lot to me to be able to attach a face to the name and experiences I’ve been thinking about for so long. But there’s one more thing to say about this portrait, and it’s a little more macabre, perhaps: certainly very Victorian. But it offers the slightest hint of the impact this woman’s traumatic early life must have had on her. Around Mrs Mulock’s neck we can see a ribbon and a locket. The ribbon is probably black, and the locket is pretty certainly a piece of mourning jewellery. Very popular in this period, mourning lockets held a memento of a dead loved one, typically a lock of hair. I think I know what is in Julia Florentia Mulock’s locket.